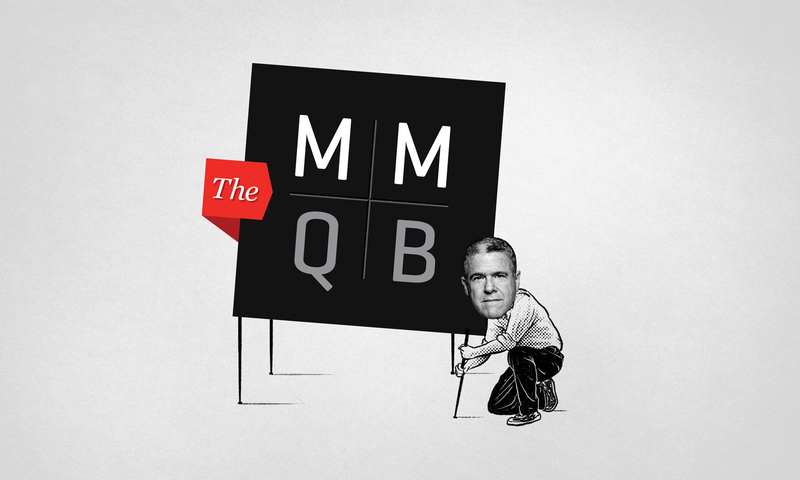 What Will SI Do With Peter King's The MMQB? Peter King’s contract with Sports Illustrated is up after this NFL season. Long famed for his access to the inner workings of the NFL and especially for his mysteriously direct connection to the mind of commissioner Roger Goodell, he may continue on as the face of the MMQB, the football vertical launched for and by him four years ago, and he may not. How the MMQB itself will fare if he goes is unclear, but the record of sports-media vanity sites does not offer immense promise. For various reasons, sites centered on sports-media personalities have tended to struggle. Grantland, which from its beginnings had issues attracting readers, imploded when Bill Simmons was fired from ESPN; Rob Neyer’s baseball site on Fox Sports, Just A Bit Outside, lasted for less than a year; Joe Posnanski’s MLB/USA Today venture Sports On Earth floundered when he left months after it launched, and went though multiple iterations before arriving at its present state; and Jason Whitlock’s attempt at ESPN’s first version of the Undefeated barely got off the ground. Even personality-based sites that retain their founders aren’t guaranteed success. Simmons’s current boutique site, The Ringer—launched after he signed a three-year, $20 million deal with HBO—has had serious problems drawing readers, though its podcasts have been successful. King and SI editor-in-chief Chris Stone insist that the MMQB is different, and that it has resolved some of the contradictions inherent in the personality-site model. (A parallel might be Yahoo’s Adrian Wojnarowski vehicle The Vertical, which, like the MMQB, was from the beginning less intensely focused on the personality of its founder and more focused on news than, say, Grantland. It has continued to break news since Woj jumped to ESPN, mostly thanks to his protégé Shams Charania.) Among other things, it was, Stone and King assert, built from the beginning to last after King leaves SI, whenever that may be. They point to the talented people at the site, and King especially is rightly proud of the careers of young journalists he’s helped launch. There are, however, reasons to be skeptical that King has built something that will work without him. Some, such as the difficulty inherent in doing without one of the most deeply-sourced NFL writers in the country and his hands-on approach to wrangling advertisers and sponsors for the site, reflect well on King. Others, such as his apparent inability to groom a credible successor and problems attracting an audience quite as big as SI would like, do not. This isn’t the first time King and SI have found themselves at a contractual juncture. In 2013, when King was being courted by other entities—reportedly including ESPN and NBC—Sports Illustrated offered him the chance to have his own site, as well as a reported $1.2 to $1.5 million annual salary. He took it. Early last year, when King was again deciding whether to stay with SI—he told The Big Lead, “I hate to be vague, but I don’t know what I’m going to do yet”—there was speculation about how the site could survive without King. Those worries were postponed when he signed an extension through the end of the 2017-18 NFL season and brought on Albert Breer from the NFL Network in a role that clearly positioned him as a possible heir apparent. Over the past year and a half, the MMQB and SI have been preparing in concrete ways for his possible departure. First, they hired Breer with at least some expectation that he might take over for King, though given a recent series of meltdowns—he demanded proof that black baseball player Adam Jones was, as he said he was, racially abused in Boston, and ordered Colin Kaepernick to prove he wants to play in the NFL—several people familiar with the situation expressed doubts that he would still be in position to take the helm. Even more notably, in late summer 2016, the MMQB homepage was folded into SI.com and MMQB reporting began to merge with SI’s other NFL reporting. Now there’s no practical difference between SI NFL writers and MMQB staffers, according to people familiar with the situation. All NFL coverage runs on the same platform; all the writers are on on the same weekly conference call; and King and the other editors work together to think of and assign story ideas, which avoids doubling up on similar stories, something King told me happened from time to time when the coverage was separate. While the unique-visitor numbers aren’t as high as SI would like, King’s willingness to ally himself (and therefore the MMQB) with brands and companies, while ethically fraught, means that less-than-ideal traffic numbers are surmountable from a business perspective. King told me he spends a big chunk of every offseason wrangling sponsors. “This year I saw 23 potential partners and sponsors total. That’s been about par for the course, three weeks of my life in each of the five preseasons. It’s just a part of this business,” King told me, adding he knew what he was signing up for and that he likes going out into the community. This, perhaps more than anything, is what would be most difficult to replace. The MMQB and SI have a solid stable of well-informed writers, and Breer is certainly capable of uncritically channeling the innermost thoughts of anonymous NFL insiders. A famous writer and editor who doubles as an effective top pitchman, though, is hard to find. Stone said that what King has created is unique and valuable enough to be sold to advertisers on its own merits, but also said his “primary wish would be Peter would continue on for another term.” That said, there are pros and cons either way; if King and SI don’t reach a new contract at the end of the football season, SI and its parent company, the struggling Time Inc., would be off the hook for a hefty annual salary. Even with the way the MMQB is already integrated into SI, losing King—whose name is still on the top of the site; who still writes a weekly column; and whose status and willingness to spend weeks mingling with ad reps gets and keeps the brands interested—would be something more than symbolic. Stone and King say the MMQB can survive without him, but even so, the property’s strengths will remain King’s, as will its weaknesses. This might explain why he is, to every indication, genuinely ambivalent about his, and its, future. Peter King: "I Am Obviously A Rube"
What About The Maturation Of Peter King? Has Peter King Read His Own Reporting On The Ray Rice Fiasco?